DD Retreat - the only family club of Kochi where every member of your family, little or old, is entertained. Because, ultimately your family matters most in your life. And so is their happiness. DD Retreat comes specially designed with this in view. 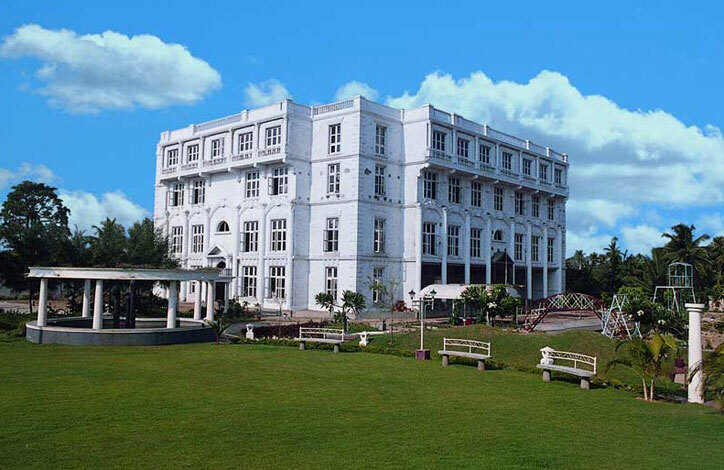 3 acres of pleasingly landscaped area, the ambience of DD Retreat thoughtfully created for your endless pleasure. 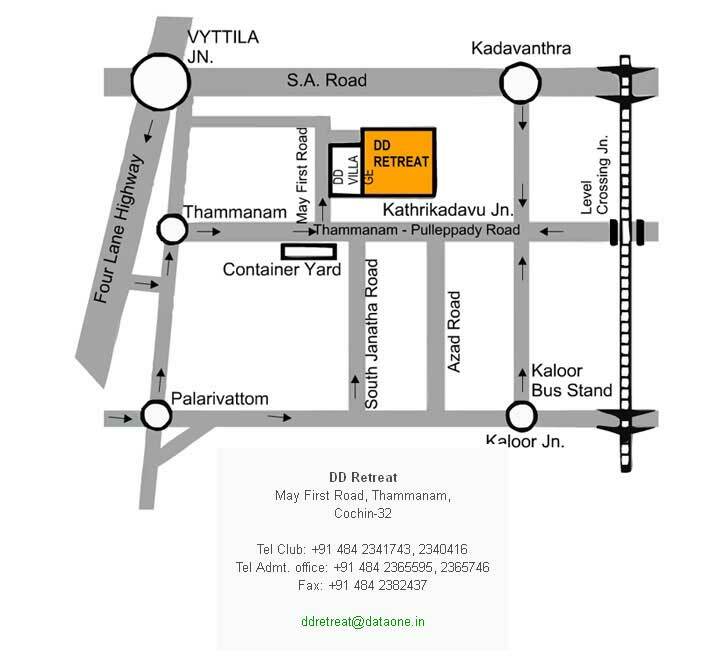 The DD Retreat is located just 2.5 kms. from Padma Jn., M.G. Road, on Pulleppady - Thammanam Road. A short drive from any part of the city. DD Retreat is complete for your complete enjoyment. The large swimming pool comes with glass window and 126 ft. long waterslide with a 7000 sq. ft. pool side area for relaxing. To ensure total hygiene, the most advanced filtration system is installed here. Besides, there are the luxuriously spaced change rooms, shower rooms, locker facilities, separate timings for gents and ladies. Some thoughtful provisions to increase your bathing pleasure. Your little ones are not forgotten altogether. There is a wading pool and a small water slide, which they'll find quite exciting. 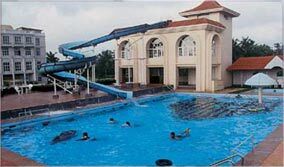 A large swimming pool with 126 feet long water slide. 7000 sq. ft. pool side deck area for relaxing . Luxuriously spaced change rooms, shower rooms, locker facilities etc. Separate timings for ladies and gents. Wading pool and a separate water slide for kids. Large glass window for under water viewing. Health club with a cardio-vascular and muscle toning centre. Modern health and fitness equipments like treadmill, exerciser cycle, stepper and climber, multi-station gym, bench press, weights and pulleys, forearm curl machine, vibro belt massager etc. Facilities like expert health club instructors and dieticians. Two tennis courts with a gallery to accommodate 250 persons. Boating facilities for children with pedaling and battery operated boats. Mini 9 hole golf course. Qualified coaches for swimming and tennis. Restaurant serving choicest dishes, Indian & Chinese. Spacious parking area and a landscaped garden. Children's play area and play equipments. A Roman styled club house of about 40,000 sq.ft. A/c. card and bridge rooms. Well furnished marriage hall for 1000 persons. 3 A/c. conference halls to accommodate up to 25 persons, upto 75 persons and upto 150 persons. 14 A/c. luxury rooms for guests. To enjoy the above, become a member of DD Retreat and give your spouse and children an exposure, which may change their destiny. Be a member and expose your children to those games, which one-day may make them national or international heroes. Indeed a matter of great pride. Minimum declared income should be above Rs. 2.50 lakhs per annum. Ownership of Zen/Santro/Matiz and above class of car. Admission reserved only to family and major children of the existing life member. No insolvency petition filed so far. Assets/Networth of minimum of Rs. 25 lakhs. Chronic alcoholics are not eligible for admission. Reference from two respectable personalities should accompany the application for membership. Tolerant in nature and compassionate towards others. Helpful in nature especially to fellow members and readiness to exercise his influence to help fellow members. Prepared to follow a dress code, if necessary. Prepared to follow the rules and regulations of the club.